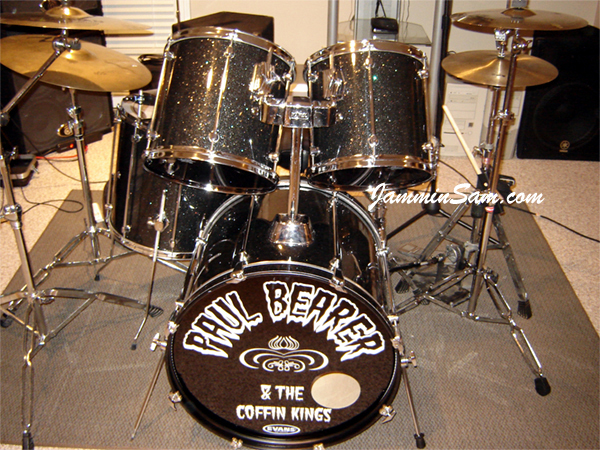 Picture sent in (February 2007) by Morgan King from St. Louis, Missouri of his Mapex drum set. Great work Morgan! Hey Sam! Here are some pics from the drum overhaul I recently did using your True Black Glass Glitter wraps! This was originally a wine red wrapped Mapex Mars Pro kit I purchased back in 1995. It has been through a lot over the years (including some too-moist environments) but has remained good-sounding. I started the redo project with the idea of painting the shells according to a custom design idea I had. I soon found that the outside birch wood layer had swollen and shrunk back and was too damaged to sand and paint with good results. So, I began searching for wraps and found your web site. 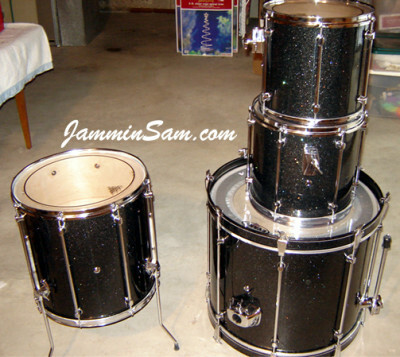 I was torn between the Black Glass Glitter finish (for the awesome looks) or the Black Sparkle finish (for the price). In the end, after talking to you and looking at the pictures on the website for days on end, I went with the Glass Glitter – and I am so glad I did that! It looks awesome in the light and sparkles brilliantly under a camera flash. I can’t wait to see my set on stage at our next show.